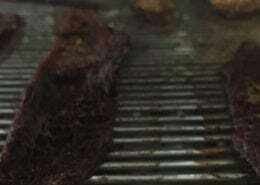 The breakpoint is the most important factor in a commercial smokehouse or dehydrator. This one feature of a commercial oven is directly responsible for cooking your product, coloring your product, and either increasing or decreasing your product yields, depending on the strength and velocity of the breakpoint. 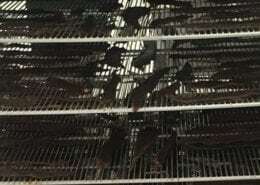 As important as the breakpoint is to cooking in a smokehouse or dehydrator, most people don’t fully understand it and how it affects their product. In order to help you better understand the breakpoint, we put together this easy to understand guide complete with explanations and airflow simulation gifs to help you understand what is going on in your oven and why it is important to purchase an oven that can control the location and duration of the breakpoint. Download the print version of our Commercial Oven Breakpoint: The Ultimate Guide. Back in the late 1950’s, an innovative new way of cooking product in the meat processing industry was discovered — an innovation that is still in use in industrial smokehouses and dehydrators today. 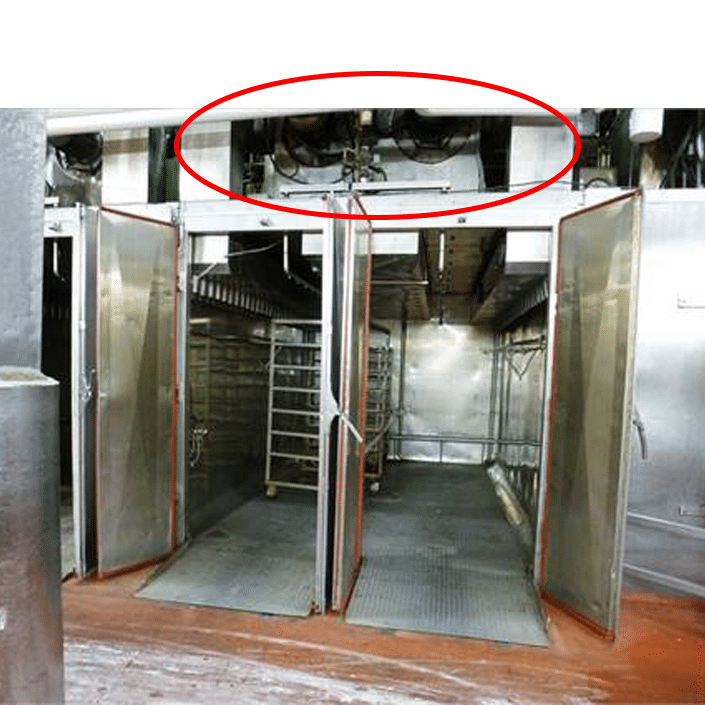 This innovation incorporated the use of alternating dampers in forced-air ovens so air from a single fan could be delivered to product on racks. The alternating dampers on either side of the oven create two opposing airstreams in the oven cabinet. The location where these opposing airstreams collide is called the breakpoint. 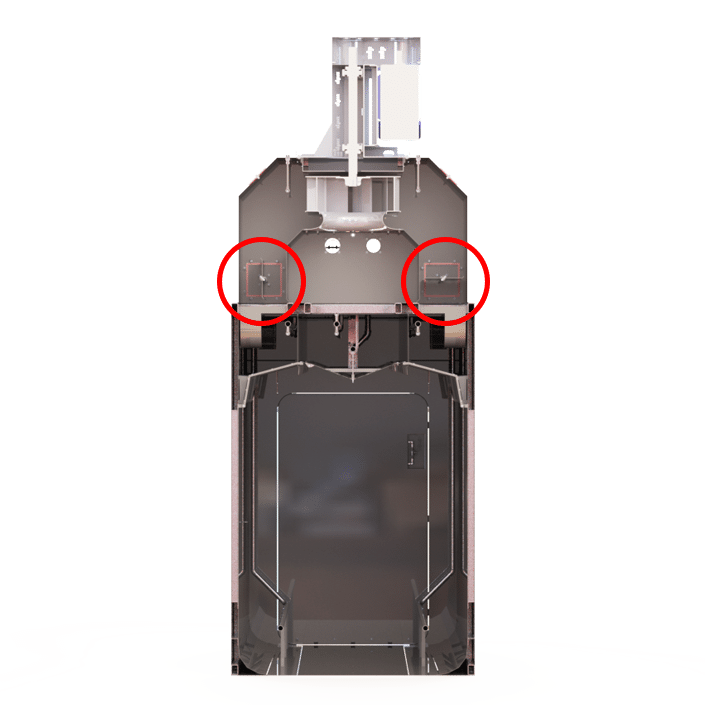 The breakpoint is the location where two opposing airstreams in the oven cabinet collide and move either horizontally or vertically through the cabinet (depending on location of breakpoint) to cook the product. The location where two opposing airstreams in the oven cabinet collide and move either horizontally or vertically through the cabinet (depending on location of breakpoint) to cook product. The breakpoint is formed by a combination of the fan, alternating dampers, and the corresponding high and low velocity airflows created in the oven. Airflow created by the fan enters the supply duct and hits the alternating dampers. The damper that is set to block the duct creates the low velocity airflow while the damper set to open creates the high velocity airflow. These differing airflows are on opposing sides of the oven. 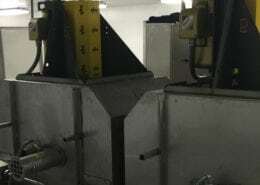 The high velocity airflow travels down the oven wall, across the floor, and up the opposing side. 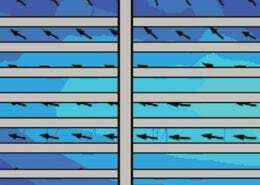 The low velocity airflow travels a much shorter distance, hence being low velocity. The collision of the low velocity airflow and the high velocity airflow causes the air to break towards the center of the oven — forming the breakpoint. When formed correctly, the breakpoint has enough velocity to penetrate through the product on your rack before the air is drawn back to the return duct. It’s this breakpoint air that ultimately cooks your product. 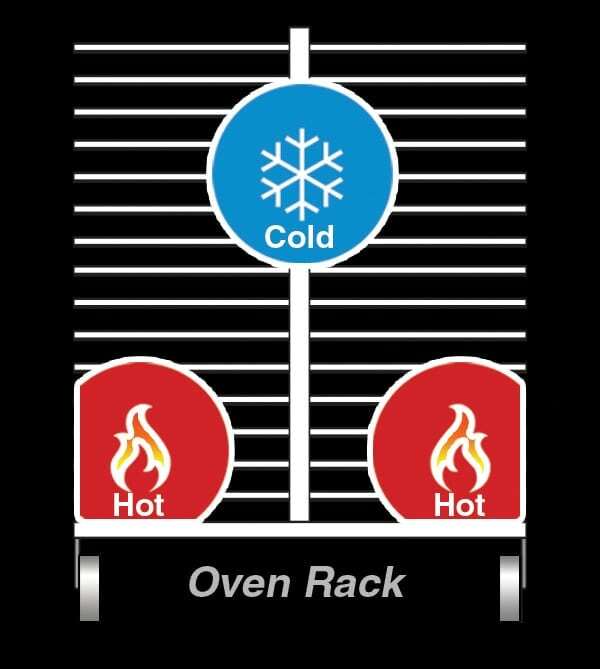 The Breakpoint the most important aspect of an oven, as it is responsible for cooking your product. The velocity of the breakpoint air as it moves across product on the rack essentially wipes away a layer of cold air surrounding the product and replaces it with hot air. As the breakpoint moves throughout the oven cabinet, it wipes away more and more layers of cold air surrounding the product. The hot air left behind is eventually transferred to the product, cooking it to the required temperature. The air that moves across your product on the rack created from the breakpoint is what cooks your product. A typical oven without the patent-pending Total Flow Control® system creates a cold spot in the top middle of the oven rack that takes longer to cook. A typical oven without the patent-pending Total Flow Control® system creates a hot spots on the lower corners of the oven truck where the air streams constantly hit and over cook product. The breakpoint plays a critical role in the consistency of your product and is often to blame for poor product yields (or the remaining weight of your product after cooking). Most commercial ovens utilize continually oscillating airflow with minimal or weak breakpoints, resulting in inconsistent product coloring and yields. Product closest to the outside edges and bottom of the truck are cooked faster and more thoroughly, while product in the upper middle and insides of the truck cook slower. The varying rates of cooking caused by fewer and weaker breakpoints in the oven leads to higher yield gaps: where some product on your rack is over cooked and other product is cooked just right. As you have likely experience, this results in inconsistent product yields and coloring. The product closest to the breakpoint often can be burnt, darker, and in some cases, needs to be thrown out, while product furthest from the breakpoint achieves the color desired. Imagine the difference in your product if there were more breakpoints in the oven! Rather than needing to overcook the product closest to the breakpoint so that product furthest from the breakpoint can be cooked, there would be more and stronger breakpoints — meaning less product would be away from the breakpoint. When there are more and stronger breakpoints in the oven, you eliminate those cold spots and your product cooks more consistently. Controlling the location & duration of the breakpoint is key to consistent yields and product coloring. The oven is built with two identical fans that operate in opposition to each other in order to create the high and low velocity air streams. All the work of creating and controlling the breakpoint lies in the how the fans work in relation to each other. The oven is built with a set of alternating dampers in the cabinet’s air supply duct. These dampers are set opposite of each other in a 90° formation to create the high and low velocity air steams. The dampers create and control the breakpoint. There are five main factors that help create and allow you to control a strong breakpoint throughout the oven, that you can see to the right. When all five factors are applied correctly, you are able to control the location and duration of the breakpoint to optimize your cook cycle and increase product consistency and yields. 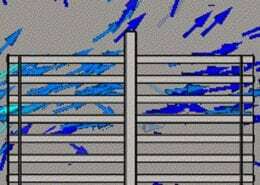 The design of how the side walls and floor meet will either enhance or degrade the velocity of the air streams, resulting in either a stronger or weaker breakpoint, respectively. 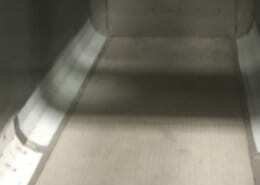 Many oven manufacturers use a 90° or 45° angle between the walls and floor, which results in the air stream degrading once hit hits those angles. A radius, or cove, design along the bottom of the walls gently pushes the airstream along the floor, maintaining the air stream velocity and resulting in a stronger breakpoint to make it across the rack and evenly cook product. The design of the supply duct plays a large role in enhancing or degrading the breakpoint. 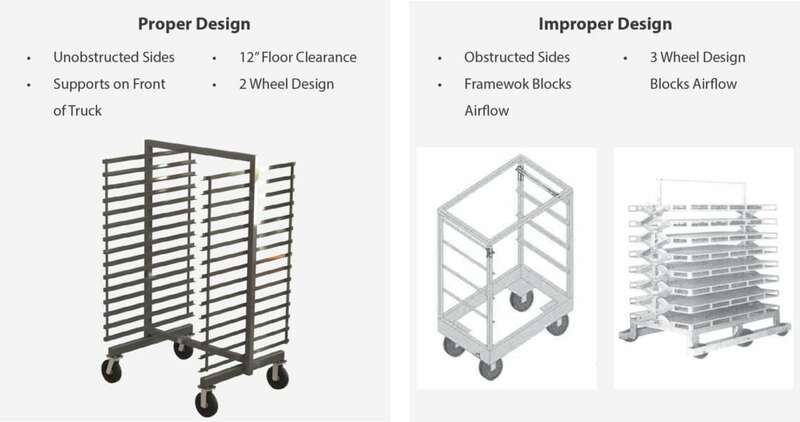 The typical cone design found in most ovens allows the high and low velocity airstreams to bounce around the cabinet, resulting in overcooking product on the edges and bottom of the cart. A knife-point design with a width of around 1” keeps the high and low velocity airstreams along the oven walls to maintain velocity and make the breakpoint stronger when the airstreams collide. A study sponsored by the National Institute of Food and Agriculture, found when one supply slot was fully open and the other was closed, the Venturi effect actually pulled the air across the cabinet with only a slip-stream pulled up into the return duct. 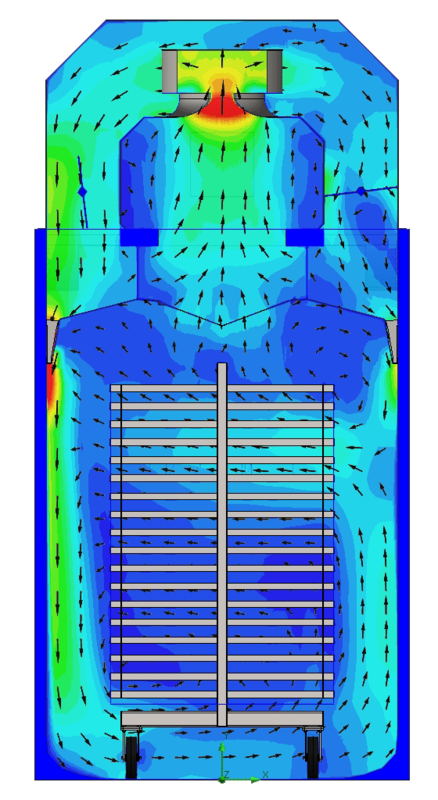 Using the extended-return duct in combination with the variable-width supply slots created much more uniform air velocities through the “cold-zone” at the top-center of the cabinet than conventional designs. Also, when used in further combination with the new high-volume air kit, the air velocities were measurably more uniform and almost double those of conventional designs. Placing a truck in your oven affects the flow of the high and low velocity airstreams that create the breakpoint. Any obstruction in the oven cabinet will cause the air flow to change — meaning the design and placement of the trucks you use in your oven is critically important. 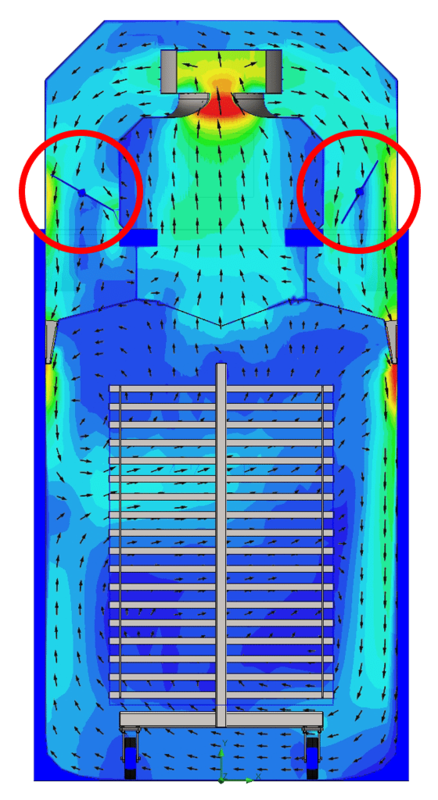 Proper airflow in an oven requires a 12” gap on the side walls and along the bottom of trucks to maintain the high and low velocity airstreams in order to create the breakpoint. 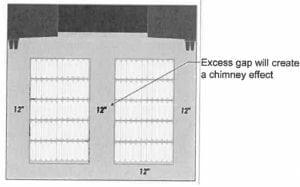 The gap between carts in a double wide over should be NO MORE than 12”, otherwise a chimney effect is created and the airstreams move up to the return duct before creating the breakpoint. How you load the trucks in an oven affects the high and low velocity airstreams as well. 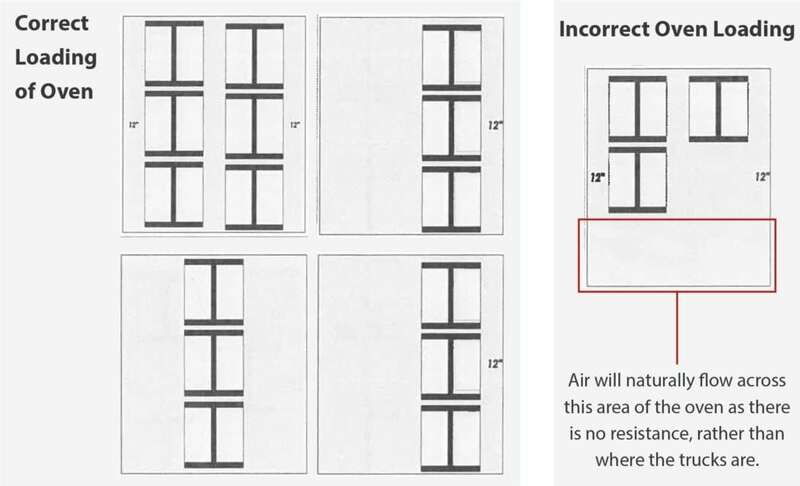 The optimal loading pattern is to fully load the oven; however, when only partially loading an oven, you should follow the guidelines laid out below to maintain the proper airflow to create a strong breakpoint. The design of the rack used in the smokehouse can greatly affect airflow in the oven, and hinder the formation of the breakpoint. As mentioned above, the high velocity airflow travels down the wall of the oven and across the floor to meet the low velocity airflow. In other words, it must travel under the rack in the oven. Any obstructions in the path of the high velocity airflow can slow down or stop the airflow. 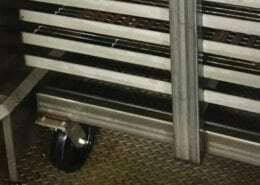 A smokehouse rack designed with a low clearance (less than 12”) will cause an airflow obstruction in the oven. This low design essentially creates a “wall” on the floor of the oven, breaking the high velocity airflow and affecting where the breakpoint occurs. In order to keep the high velocity airflow from being obstructed, the rack should have minimal obstructions up to 12 inches from the floor. The final piece of the breakpoint puzzle is damper positioning. The ability to position the dampers at varying degrees and keep them in place for long periods of time (rather than a continual rotation), allows you to control exactly where the breakpoint occurs in the oven. The breakpoint needs to be positioned at the height of the product, not too high, which bypasses the product envelope, and not too low that it is not directing airflow to the upper corners of the product envelope. Adjusting the angle of the dampers allows more or less airflow into the oven cabinet. As the dampers adjust, the velocity of the air released changes — either increasing or decreasing the high velocity airflow to go further or less in the oven. When the airflows change velocity, the point where they collide (the breakpoint) changes locations in the oven. 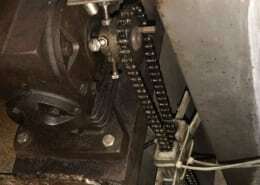 The speed at which the breakpoint moves is dependent upon the damper shaft’s revolution per minute. In order to get good heat transfer and enough exposure to the oscillating airflow for even drying of product, the RPM of the supply airflow dampers should run between 0.25 and 0.5 RPM, or its equivalency if the dampers move back and forth from 0 degrees to 90 degrees.